Cameron Van Der Burgh's time for this 100 m event was 58.46, a world record. Each frame is .1 seconds apart. A noteworthy feature of Cameron Van Der Burgh's swimming is that he moves very quickly. His stroke cycle takes 0.9 seconds, which is possibly the shortest duration among today's top male breaststrokers. Fast swimming comes from fast movements and he is a good example of that axiom. Frame #1: The swimmer is streamlined from his waist through to his hands. His kick is about half way through its propulsive phase. This is an excellent example of kicking force propelling the swimmer in a minimally resistant position. Frame #2: As kick propulsion is completed, the hands begin to be spread apart. The non-propulsive sections of the swimmer's structure remain streamlined while his legs are out of streamline, but that is not of concern during propulsion. Frame #3: The hands spread and are positioned to apply force backward. The upper arms are abducting and the elbows begin to bend. The feet have come together. As the arms spread, the legs close – an interesting example of oppositivity. As the feet come together, the legs are raised to streamline, the force for that action being the muscles of the lower back. This is an excellent example of streamline for all body segments except the propulsive arms. Frame #4: Very powerful abduction of the upper arms provides strong total arm forces in both the horizontal and vertical planes. The vertical force component supports a slight arching of the lower back and the head rise. The legs have arched and are now completely in the shadow of the body and would be minimally resistant. This is a unique feature of this swimmer's action and is worthy of copying. Frame #5: Arm propulsion is completed. The forearms "cut" inward while the upper arms complete a small amount of adduction. The pull is completed totally in front of the line of the shoulders. The legs remain elevated. The head is out of the water. The overall curved line of the swimmer from the shoulders to the toes is maintained. While this analyst has made a big deal of straight horizontality for streamlining it is likely that the concave curvature of the total swimmer could be more effective than the horizontal. Which is better will not be known until appropriate research is conducted. This innovation is worth pursuing to determine its true value. Frame #6: The hands have come together and the elbows are close to the swimmer's sides. It is intriguing to ponder if this swimmer's performance would improve if he employed a Rebecca-Soni-elbow action at the initiation of recovery. It would reduce turbulence and also have the swimmer back to forward streamline faster than the current time-consuming resistance-producing inward arm movement. [That would be a good research topic for an interested and competent graduate student.] The streamline-arch is maintained. The shoulders and head have broken through the water surface. Frame #7: The hands are in a "prayer" position ready to be lifted out of the water. The line down from the shoulders to the knees is almost straight. [The straightness is more likely in male than female swimmers.] The legs begin to bend at the knees in preparation for kicking. Frame #8: The hands have broken the surface in the recovery. The head and shoulders are being returned into the water. The legs have been drawn up further with the knees contributing most of the repositioning to this point. Some hip flexion has begun. Frame #9: The hands and arms have been returned to the water and considerable turbulence (the white water on top of the arms) is created. One has to question whether this sudden increased turbulence is greater in its detrimental effect than the short-lived resistance reducing over-the-water recovery. [This writer still argues that the recovery should be direct and underwater.] The kick is ready to start its propulsive phase. Frame #10: The position illustrated is almost the same as that in Frame #1. The length of time that the knees increase frontal resistance is very short (approximately 0.2 seconds). It is to a swimmer's benefit to perform resistance-increasing movements in the shortest time possible. Frames #11 and #12: The positions of Frames #2 and #3 are almost replicated. 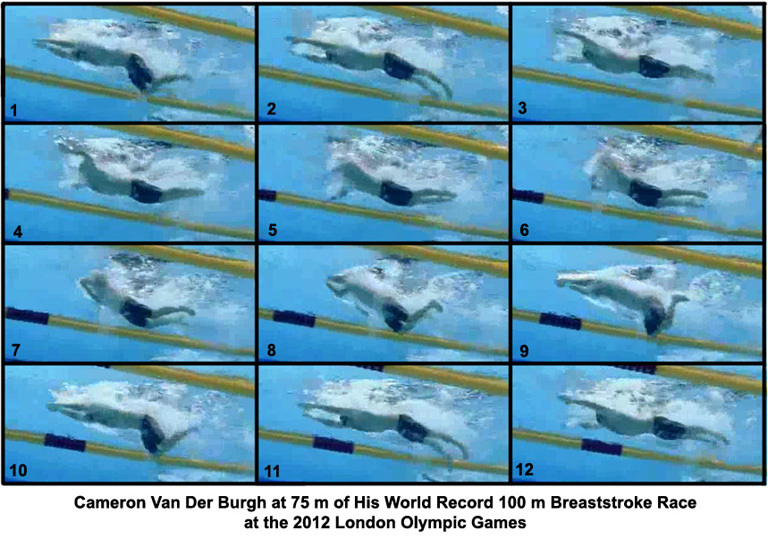 It is not difficult to see why Cameron Van Der Burgh is the fastest 100 m breaststroke swimmer of all time. His streamlining is excellent. The total-swimmer arched streamlining is just as effective as and theoretically better than straight-line streamlining because it reduces the amount of water on top of the swimmer, much of which is pulled along with the swimmer for varying lengths of time. The propulsive phase of the arm pull (Frames #3 to #5) is short but apparently effective. The arm pull also provides force to elevate the head and shoulders in the breathing action. The speed of kick preparation and execution, the re-attainment of streamline after arm recovery and the return of the head and body into the water is the fastest yet shown on this web site. The overall reduction in resistance production by completing necessary but potentially harmful movements as fast as possible is worth copying, but only if effective force production following those movements is achieved.